You've Been Approached by Your Dream Acquirer. Now What? - Berkery, Noyes & Co., LLC. 2017-01-20 You’ve Been Approached by Your Dream Acquirer. Now What? If you have a well-run company that has had staying power or enjoys a strong reputation, you’ve likely received an unsolicited call from an acquirer expressing an interest in the company. With stock prices relatively high, interest rates low and capital readily available, private company owners are increasingly being approached by both strategic buyers and private equity firms to acquire their company. Strategic buyers (i.e., corporations) have been struggling since the recession to meet their growth objectives solely through organic growth and are seeking new sources of revenue. Your company may be attractive to them simply due to your customer base or because of a unique product or service that you provide that they can offer to their customers. Beyond strategic buyers, private equity firms are commonly reaching out directly to business owners, seeking “platform” investments (an investment that stands on its own in the firm’s portfolio) or add-ons to existing platform companies. Oftentimes these inquiries come when you least expect, and can catalyze a host of anxieties for the owner(s). Get a market test. Don’t limit your dialogue to just one buyer. The single best way to get a better valuation for your company is to receive multiple offers. You may be selling yourself short by not dropping another line in the water. If you’ve ever had work done to your home, think back to the wide range of quotes you received from various contractors. Stay focused. Entrepreneurs who have sold their companies or raised capital consistently state that they dramatically underestimated the time and effort required to get the deal closed. Answering to extensive data requests while negotiating the best deal can distract a business owner from daily operations. Having your company’s performance go off the rails during the courting process not only will kill the transaction but severely impair your ability to find another suitor. Don’t get blinded by the headline number. There is always a trade-off between the price paid for a company and the structure and terms of the deal. You must have a complete understanding of the makeup of any offer. If it’s a cash deal, how are the payments structured? If equity is received in a new entity, where will it sit in the capital structure? How much leverage will be placed on the company going forward? How long do you need to stick around? Price talk makes for good cocktail party chatter, but if the terms are onerous, you will need those cocktails to keep coming. Lean on your trusted advisors. They have closed dozens of deals. Most business owners, if they have any deal experience at all, have closed one or 2 M&A deals over their careers. The right advisors – accountants, attorneys, M&A advisors, and personal financial advisors – have deep experience in guiding you through the process while making sure you are protected. Just by hiring a professional team signals to the buyer that you are seriously considering their offer, promotes a bit of urgency and may elicit a better price without too much trouble. Samuel Johnson said, “Just praise is only a debt, but flattery is a present.” And if the present comes from your dream acquirer, Christmas comes early. But wouldn’t it be nice to know you got the best one possible? Berkery Noyes is an independent investment bank that provides M&A advisory and financial consulting services to middle market companies in the information and technology industries. The firm offers skilled transaction management to publicly traded and privately held businesses and private equity groups in both sell-side and buy-side transactions. Berkery Noyes has managed over 500 transactions, ranging from several million to more than four billion dollars in value. Martin Magida is a Managing Director at Berkery Noyes, where he primarily assists clients with raising growth capital in the debt and equity markets. He also provides M&A advisory services to companies throughout the middle market. 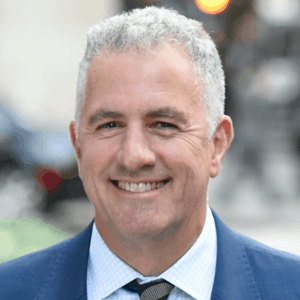 Martin holds a BA in Political Science from Union College and an MBA in Finance from the Leonard N. Stern School of Business at New York University, and is a Chartered Financial Analyst.